Barahona is a Dominican province. It is in the southwestern part of the country. Its capital city is Santa Cruz de Barahona. It was created as a Maritime District, an old category given to some regions along the coast, on 12 September 1881. The Dominican Constitution of 1907 changed the Maritime Districts to provinces. The province takes the name from its capital city, Santa Cruz de Barahona. Barahona is a Spanish last name, and it seems that a Spanish colonist with that name lived in the area. Barahona is bordered to the northwest by the province of Baoruco, to the northeast by Azua, to the west by the Independencia province. 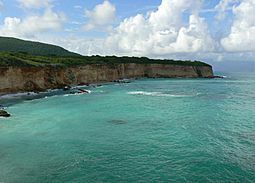 The Pedernales province is to the southwest and south of Barahona and the Caribbean Sea is to the east. The province was part of the old Azua. It was created as a Maritime District on 12 September 1881 with the municipalities of Santa Cruz de Barahona, Cabral, Duvergé, Enriquillo and Neiba. Its category was changed to province by the Dominican Constitution of 1907. Two new provinces were created from the original province of Barahona. The Baoruco Province was created in 1943 and then the Pedernales Province in 1957. Cabral and Enriquillo are municipalities of the province since 1907; later, other municipalities were created: Paraíso in 1974; Vicente Noble in 1978; Las Salinas and Polo in 2001; El Peñón in 2002; Fundación in 2003; and La Ciénaga and Jaquimeyes in 2004. In 2010 (last national census), there were 187,105 people living in the Barahona province, and 156,513 (83.6%) living in towns and cities. The population density was 112.7 persons/km². Its population represents 1.98% of the total population of the country and the province is ranked as the 14th (out of 31 plus the National District) more populated province. As of 2016[update], the total estimated propulation of the province is 188,820 inhabitants. The largest city of the province is Santa Cruz de Barahona, its head municipality or capital, with a population (in 2010) of 62,054 inhabitants. The Barahona province has a total area of 1,660.2 km2 (641.0 sq mi). It has 3.6% of the area of the Dominican Republic and it is ranked as the 12th (out of 31 plus the National District) largest province. The altitude of Santa Cruz de Barahona, provincial capital, is 47 m (154 ft). There are two important regions in the province: the valley of the Yaque del Sur river, in the north of the province, and the Sierra de Bahoruco ("Bahoruco mountain range"). Because the Sierra de Bahoruco gets to the coast, most of the population lives on the coast or near the river Yaque del Sur; the only town in the mountains is Polo. The eastern part of Sierra de Neiba is in the northwest of the province and the Sierra Martín García is the limit with the Azua Province, in the northeast. The valley of the river Yaque del Sur is an important farming centre in the southwest because people here uses the water of the river to grow different crops, mainly plantain and sugar cane. The Rincón lake is in this valley; fishing is an important activity in this lake. The Sierra de Bahoruco is in the rest of the province (south, center and west); the part of the Sierra de Bahoruco that is in the province of Barahona is called Bahoruco Oriental (Eastern Bahoruco) because it is different from the rest of the mountain range. While pines are common in the Sierra de Bahoruco, they are not common in Eastern Bahoruco where there are rainforests because those mountains, and the province, have the Caribbean Sea to the east and winds bring a lot of water that falls on the mountains. The highest mountain in Eastern Bahoruco is Pie de Palo (1,603 m). Other high mountains are Trocha de Pey (1,476 m), La Torre (1,455 m) and Loma Remigio (1,287 m). The most important river of the province is Yaque del Sur. Other rivers are Nizaíto (23 km long) and Bahoruco (14 km). The river San Rafael is only 3 km long but many persons go there during summer to enjoy its cool waters and part of its water is taken to the city of Barahona. The climate of the province is a tropical climate, very hot and dry in the valley, but it is cooler on the mountains. In the valley, cacti and other plants of dry regions are common. Rainforests are common in the mountains of the province because it rains a lot in the Bahoruco Oriental. There are three important roads in the province, and they get to the border with Haiti. One of them goes through the province from north to south and gets to Pedernales after crossing the Sierra de Bahoruco by the coast. The other two roads get to Jimaní; they go around the Lake Enriquillo, one by the northern side and the other by the southern side of the lake. The main economic activity of the province is agriculture; the main products are coffee in the mountains and plantain and sugar cane in the valley of the river Yaque del Sur. Other important economic activities are industry (sugar and textiles) in Santa Cruz de Barahona and fishing along the Caribbean coast. Barahona Province Facts for Kids. Kiddle Encyclopedia.